Note: Subscribe to our mailing list, we’ll notify you when we publish text translations like the one below. Note: You can help our work continue and grow with as little as $1/month through our Patreon page. Hezbollah leader Sayyed Hassan Nasrallah has urged Yemenis to remain steadfast and hold firm to their battle fronts and positions, as the Saudi-Emirati-American coalition has “failed” in the country, and that ‘victory was closer than ever before’. 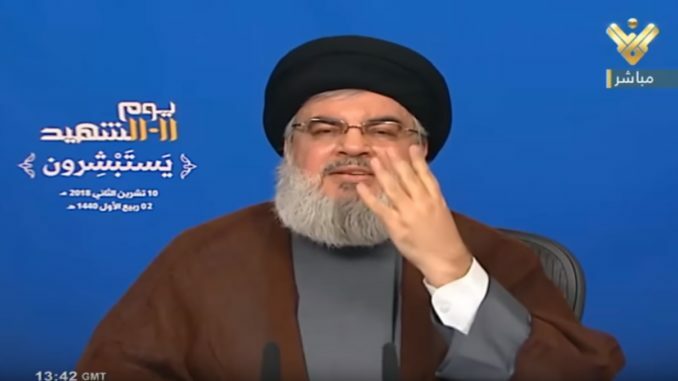 Nasrallah called for caution in relation to the recent call by the United States for warring sides to end the conflict, warning that it could be a ploy or time-buying measure. If it was indeed a serious call, Nasrallah said that it has come about due to the steadfastness and perseverance of the Yemenis, and not due to anti-Saudi back clash from the Khashoggi saga, nor the sudden awakening of world conscience towards the ‘four years-long massacre of the Yemeni people’. From about one month and a half ago, the world became preoccupied with the heinous crime which was perpetrated against the Saudi journalist Jamal Khashoggi in the Saudi consulate in Istanbul. The whole world was astonished also, by the details of the crime. In relation to the kidnapping, killing, dismemberment with a saw, and the melting (of the corpse) with acid, and the throwing out of what was melted in the sewerage. The world has the right to be astonished, amazed, and to condemn (this crime). Ofcourse many are looking for ways to get this issue to pass. In the Arab world, no one was astonished, amazed, nor did they condemn. To the contrary, they stood in solidarity (with Saudi Arabia). That is normal in the Arab world: to dismember using a saw, to cut using a sword, to melt using acid, this is normal (to some). It is natural for the world to be astonished, amazed, and to condemn (this crime). However, what is strange of this world, is that it does not take notice of, nor is it astonished by, the daily images of the heinous massacres in Yemen. (The world’s) conscience was not moved by the Yemeni children – the United Nations itself saying that hundreds of children face death every single hour in Yemen. The United Nations – not us – are speaking of 14 million people threatened with starvation, and this figure may have risen in recent days. Hundreds of thousands of Yemenis have been infected by cholera and face the possibility of death, and the world is silent. (Just) now the world has begun to talk, the Americans have begun speaking, the Europeans have begun speaking – ofcourse, Arab silence, and silence in the Islamic (world), except for a few states. In general, silence! No one dares to open their mouth. Allahu Akbar (Editor’s note: this phrase is to express wonder). How great is (the fear) of the sword, and how great is the allurement to money and the glitter of gold, and how great the (level of) submissiveness in the Arab world! For you to know why we have reached this state of affairs in the Arab world, just look at the Arab stance towards developments in Yemen. In any case, we are before a new situation. I don’t want to just talk and condemn. No, we are before a new situation. Perhaps the Khashoggi event caused some change, perhaps. Perhaps it was exploited as an incident for another purpose. In any case, it is good that we hear American, European, and UN statements, calling for the cessation to the fighting and a stop to the war. This issue requires some comment: perhaps (this call for an end to the war) could be serious, this possibility is valid. It is also possible that this is merely a (deceptive) ploy and a way to buy time. It is possible that this is a serious (call to end the war), and this possibility has valid reasoning to support it. However, this possibility has not arisen because of the killing of Khashoggi, nor is it because the conscience of the world has now (supposedly) awoken. The world has been seeing the children, the immense massacres, bombardment and killing on a daily basis for four years. Why did the world only now say that this war must stop? This requires some contemplation. Simply and frankly, because the Yemenis remained steadfast in this battle. This is a huge lesson. Because they remained steadfast in this battle, and because the Saudi, Emirati, American coalition failed in this war. If this possibility (i.e. the call for ending the war) is serious, then the aim of it will be to rescue the Saudis and Emiratis, more than it is about rescuing the Yemenis. Because this coalition failed to invade the north (of Yemen), and failed to administer the south, and they are losing both the north and south of Yemen. The north due to the steadfastness (of Yemenis) and military failure, and the south because of the popular movement (of Yemenis) and administrative and political failure. America is coming today to rescue its guys in the region. Trump and the American do not care about Yemen’s children. Yet what concerns us is the result. What matters for us is that this war and fighting ends. What is interesting though is that (the Americans) said (the war must end) within one month. Why one month? Why not now? Why not immediately?! This point also has the careful attention of our brothers in Yemen, or they must pay careful attention to it. It is as if the Americans are telling this Saudi-Emirati coalition: ‘You have one month. Organise your affairs, see what (military) equations you can secure, see what (military) achievements you can muster, (because) after one month the world will tell you to stop’. For this reason, what is strange and noteworthy is that at the same time that American and Western statements were being issued calling for an end to the war, we witness in Yemen the highest escalation (of military attacks) in many months i.e. the current escalation on the southern coastline and the Hodeidah region. This is presuming that this possibility is serious. In any case, if this was a deceptive ploy, so that the Yemenis could be deceived (to drop) their weapons (and withdraw from their) battlefronts and positions, they must be wary not to be deceived, because usually when fighters sense that the fighting is almost over, their determination, attention, and awareness begins to lessen, assuming that everything appears to be winding down. This is often the case in human (history). On (the occasion) of Martyr’s Day, and at a time when we take pride in the martyrs of our brothers and people in Yemen, I say to my brothers over there to remain patient and keep preserving in your fight, and hold firm to your weapons, fronts and positions. You today are closer to victory than ever before! And the victory of the Yemenis is in their remaining in their land, (and) in preventing this barbaric aggression from achieving any of its goals. They are persevering and producing a military miracle, a military legend, (one) that is unfolding every day at the southern coastline and on the various Yemeni fronts. How can we help the struggle of the Yemeni People ?